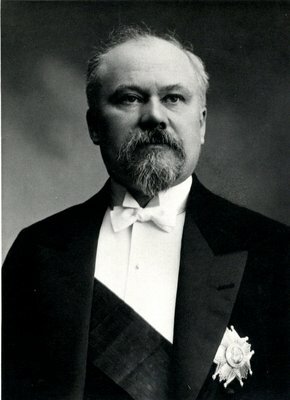 Raymond Poincaré (1860-1934) was the first person from overseas to be elected Rector of the University. He held the office from 1914 until 1919. Poincaré was a former Prime Minister who had been elected President of France in 1913. After his country and Britain went to war with Germany in August 1914, the political clubs at the University agreed to issue a joint invitation to him to stand unopposed for the rector's office, as a gesture to "the close bond of union between France and Great Britain". The candidates who had previously been nominated to stand in the election agreed to withdraw. In November 1919, the students greeted Poincaré with a spirited rendition of the Marseillaise as he entered St Andrew's Hall to deliver his rectorial address. During the ceremony he was awarded an honorary LLD. He delivered an emotional speech on a day close to the first anniversary of the Armistice, referring to the "auld alliance" and to the sacrifices made by Scottish men and women who fought in France during the war. Afterwards, he was presented with the freedom of the city of Glasgow. Born 20 August 1860, France.